How can we solve congestion? How can we make transport more reliable? How do we reduce the environmental impact of transport and logistics? How do we improve traffic and transportation safety? How do we deal with the transportation impacts of climate change? How do we make responsible use of novel development in technology to deal with these issues? These are just examples of questions that the Transport & Planning Department at the Faculty of Civil Engineering and Geosciences is looking into. By performing top scientific research and by educating world class transportation engineers, we aim to contribute to the creation of an efficient, sustainable and resilient transportation system. Research at T&P is conducted across a multitude of relevant research themes, organized via eleven collaborative labs (the so-called T&P labs), and led by one or two Principle Scientists. Next to doing state-of-the-art research, we provide transport and planning courses in the Bachelor programme Civil Engineering, we offer a Transport & Planning track in the MSc programmes Civil Engineering, and we participate in the interfaculty MSc programme Transport Infrastructure and Logistics. 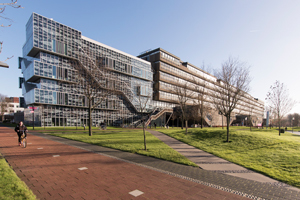 Two PhD and one postdoc positions are open at Delft University of Technology as part of the SAMEN project ‘Safe and efficient operation of AutoMated and human drivEN vehicles in mixed traffic’. According to Rob Goverde, professor of Railway Traffic Operations & Management, Dutch railways should switch much faster to the modern European ERTMS communication standard for rail traffic control and safety. This is a key message in his inaugural address to be held at TU Delft on Friday, 9 November. PhD students Alexandra Gavriilidou and Marie-Jette Wierbos have just finished an intensive cycling experiment. The checklist: 1000 metres of tape, 200 caps, 8 tracking cameras and 1 hall in Ahoy Rotterdam. Scientists have long shied away from predicting cycling behaviour but now TU Delft is gearing up to change all that. How does the crowd at an event move, when do people stop and how do you ensure that safety is not compromised? A large-scale experiment is being conducted at Delft University of Technology to gain a better understanding of the behaviour of pedestrians during busy events. Amsterdam’s North South metro line is nearing completion. It is not often that a city’s public transport system is given a structural shake up of this magnitude. Transport & Planning postdoc Ties Brands saw his chance and decided to study the impact of the new line on the surrounding public transport network. The self-driving car is on its way. Or is it in fact already here? In June 2017, Transport Minister Melanie Schultz van Haegen opened the Researchlab Automated Driving Delft (RADD) on the TU Delft campus. In the lab, automated driving experiments are being conducted under the supervision of Professors Bart van Arem and Dariu Gavrila. How do people get to know a city? What if you are a student or a tourist and you find yourself in a city you have not been to before? How do you go about finding your way? Do landmarks such bridges, churches and other characteristic buildings help? To find out, Transport & Planning PhD Lara Zomer kitted out 250 bikes with gps trackers. A self-driving car to transport wheelchair-bound children? How feasible would it be to use driverless vehicles to transport children with multiple disabilities from day care centre Omega in IJburg (Amsterdam) to their new home some 400 metres away? That is what a group of parents asked TU Delft. They would like flexible and small-scale transport to cover the short stretch of road so their children can get from one place to the other more quickly and whenever they want. Researcher Niels van Oort and his colleagues were intrigued and set about investigating.